Some products recommended by ourbabydays.com for toddlers 2-3 Years from popular online retailer Amazon. If you wish to buy any of the recommended products, or find out more about them, please click on the product image which will take you to the Amazon store. Skip Hop New Fox Toddler Backpack. Handy item for older toddlers. Once a baby changing bag is no longer needed, a toddler backpack can be taken when out and about to store items such as snacks, drinks bottle, change of clothes, pants or pull ups for when toilet training, and comfort items. Also useful if toddler goes to a childminder, nursery, or day care. This large and spacious bag is hardwearing, durable, and is made of a canvas material so is easy to wipe down and clean. It also has an insulated front pocket to keep snacks at the right temperature. Available in a choice of different colours and designs. Toddler Reins and Harness. Perfect item for when out and about with a toddler. It gives a toddler the freedom of being out of the pram/stroller, and the opportunity for exercise, but keeps them safe and close to an adult at all times. Designed to be padded and comfortable for a toddler to wear. Length is adaptable to suit the needs of toddler and adult. Machine washable. Crocs rain boots/wellies with handles for a toddler to put on independently. Great item for wet weather or when playing/walking in muddy areas, such as parks or countryside, sandy beaches, or in snow. Lightweight and waterproof all weather boots. A must-have for all toddlers. Available in a choice of colours and sizes (check universal chart for correct sizing). Stainless steel toddler drink bottle with toddler friendly straw. This drinking bottle is a great item for active toddlers as it is easy to carry around, put into a backpack, and for meal times. It is an eco-friendly, non-toxic healthier option for toddler and environment. Holds 350mls of liquid and is spill proof, durable, and long lasting. Cotton hooded poncho towel with cute crab design on front and back. Suitable for toddlers from 2 years old. This towel is a perfect item for bathtime, swimming, or on the beach, as a toddler can wear it, keeping them dry and warm. Fun design makes it attractive to toddlers. 100% cotton velour. Measures 24 x 48 inches, making it spacious with room for toddlers to grow. Machine washable. Paw Patrol character raincoat and umbrella set. Suitable for toddlers from 2 years old. Its blue and red design makes it suitable for either a boy or girl. Waterproof and comfortable for use during wet weather, keeping toddler dry. Snap button closures on the coat. Can be left to air dry when wet. Hand wash only. Great as a gift. The set is also available in pink. Classic toddler bedframe. Mattress can be purchased separately. Perfect first bed for a toddler. Includes a rail at each side, preventing a toddler from falling out of bed, and stand low to the floor making it easy for them to get in and out of. Suitable for toddlers up to 50lbs (approx 18 months to 3 years old). Made of a wood material and is available in a few colours. All fixing and self-assembly tools included. Check manufacture's instructions for size suitability. Organic bamboo toddler tableware set in cute animal design. Set includes l plate and bowl, cup and cutlery (fork and spoon). Shatterproof and suitable for both hot and cold foods and liquids. Great products for older toddlers (2.5 to 3 years old) learning to eat independently at the table. All items are made from non-toxic, plastic free, eco-friendly bamboo fibre, making it a healthier choice for toddler and environment. Dishwasher safe but not suitable for use microwave or oven. Gro clock sleep trainer. This item is very popular with both toddlers and parents as it is designed to teach a toddler about night and day, sleep and awake times. Gives toddlers who are too young to know the time of day, or to read an ordinary clock, an idea of when it is time to sleep (showing stars) or when they can get up (showing a sun on the LED light). The appropriate wake-up time can be set by an adult. Includes a bedtime book. Both items used together can greatly improve sleeping routines. Starry night twinkle blackout curtains for a toddler's bedroom. These curtain are designed to give a starry night view in a toddler's bedroom but also to block out the light, making the room and sleep environment relaxing and cozy. They are made from polyester, are easy to maintain, and are machine washable. Come in a choice of 1 drape/curtain or a pack of 2 depending on window size (check manufacture's instructions on sizing). High quality, eco-friendly, thermal and soundproof. Available in a choice of colours. Munchkin Light My Way Nightlight. 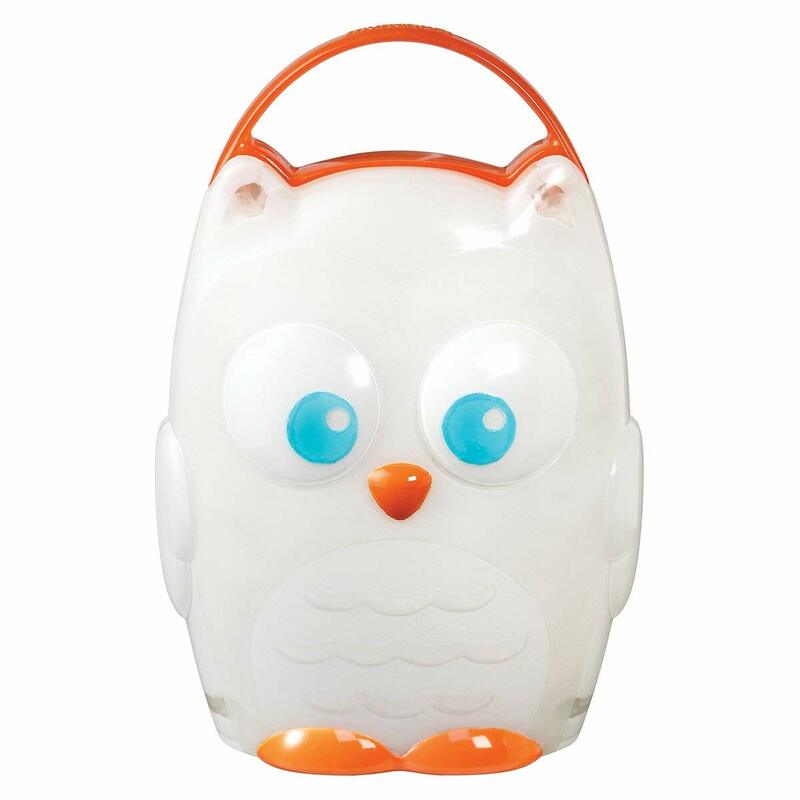 Portable nightlight for a toddler's bedroom in cute owl design. Battery operated so no cords required. Nightlight can glow for up to 20 minutes before automatically switching off, giving a toddler a secure light whilst falling asleep. LED technology makes it cool to touch and safe for young children. It is easy for a toddler to switch on at any time during the night or early morning if they need a light, and as it is portable they can carry it with them for trips to the bathroom. 3AAA batteries required. Waterproof mattress protector. This is a must have item when night time toilet training with a toddler. It prevents leaks going through to the mattress. This protector is made from soft natural bamboo, is chemical free, hypoallergenic and antibacterial, and is machine washable and dryer safe. Check measurements for suitable size (fits most standard cribs/cots and toddler cot/bed mattresses). Naty eco clean portable potty. Comes with flushable liners (no plastic and made from sugar cane so are biodegradable) reducing the need to wash out the potty after every use. A compact, comfortable, sturdy and portable potty. Great for toddlers beginning their journey into potty training. Comes in a gender neutral colour and is suitable from 18 months to approx 3 years of age. Extra liners can also be purchased. This Step Stool is a great item to have in the bathroom while a toddler is potty training and for a year or two afterwards. The step is perfect for reaching an adult height toilet and using to step up or down and for hand washing if an adult sink is a bit too high for the toddler to reach independently. Can be used alongside a regular potty or toilet training seat for successful potty/toilet training. This step is plastic making it wipe clean. Sturdy, long lasting, and durable. Anti-slip area on the step, and underneath, prevents slips and falls. Can hold weight up to 70 pounds. Potty time potty watch. This is a fun and practical item to gain a toddler's interest in going to the toilet. Worn by the toddler, this watch can be set for 30 min, 60 min or 90 min as a prompt to remind adult and toddler to go to the toilet. This type of product makes the training fun as toddlers wait for the alarm. It will sing tunes and flash a light to remind the toddler it is toilet time, then reset itself again, making it a consistent reminder all day long. Also as it is fun the toddler is more likely to co operate. A great practical aid for potty/toilet training. Battery operated and available in a choice of 3 different colours: red, blue, or green. Not waterproof so needs to be removed for bath/shower times and kept away from running water during handwashing. Toilet training seat for boys and girls. This training seat fits most standard oval shaped toilets and is no-slip so stays in place giving toddlers security while sitting on it. Also has a splash guard at the front to prevent any leaks or accidents. Lightweight but sturdy making it the perfect beginner toilet seat for toddlers who are not using a potty, or are just progressing on to an adult full size toilet. Sesame Street Elmo toddler reward, potty training motivational chart. Can be used for progress in potty/toilet training. Includes a chart, stickers, and books. Includes a section for each day of the week for monitoring progress. Can be motivational for toddlers struggling to co-operate with potty/toilet training and acceptable behaviour. Jungle theme behaviour chart. This chart can also be used in a variety of ways depending of the need either for potty/toilet training or for good and appropriate behaviour, such as sharing, co-operating with daily routines, eating meals and snacks, being kind. Comes with sections for specific chores or tasks. Can be used as desired by each family. Includes stickers, a pen, and A4 size chart. Good motivational aid for toddlers in helping to promote good behaviour. Thomas The Tank reward stickers. These are a must-have for any toddler fans who will love to receive a Thomas and friends sticker for completeing a task, for good behaviour, or for potty training success. Can be used on a homemade reward chart or purchased alongside a traditional reward chart. Includes over 200 stickers at perfect size to fit on any standard chart. Disney Princess reward stickers. These are a good buy for fans of Disney princesses. A sticker is received for completeing a task, for potty training, or for good behaviour. Perfect size to fit on any standard reward chart. Includes 276 stickers of the various princesses and related images. Peter Rabbit soft toy is the perfect comfort companion for a toddler. At 6.5 inches tall (also available in other sizes) it is a good size for toddlers to carry around and play with. Soft and cuddly. Good quality. Suitable from 12 months old. Can be hand washed. Also a great gift idea. Taggies sherbert lamb lovey toy. This is a combination of a soft toy and taggie. Great item for a toddler who is settled and calmed by textured toys. Very soft fabric that is 12 inches long. Can be hand washed or machine washed on delicate cycle. Suitable from birth as a comforter. Also makes a great gift for a newborn or baby shower. Jelly cat bunny and blanket comforter. This product is a combination of a small bunny attached to a small blanket (13x13 inches) making it a perfect soothing/comforting item for toddlers. Soft and cuddly. Machine washable. Suitable from birth and available in a variety of colours. Winnie the Pooh soft toy. Suitable from birth. 25cm size soft bear with knitted jumper. Made of soft and cuddly material. Perfect comfort item for baby or toddler. Also great as a gift. Can be machine washed on delicate cycle. Mini ride on pram/stroller board for older toddlers. Great item to fit onto your pram/stroller if you have an older toddler or young child who no longer needs to sit in a pram/stroller but can become tired on long trips out. This board fits most prams/strollers (check retailer for specific models). A child can stand on the back and ride on while an adult pushes the pram/stroller. Also useful when in busy areas, such as shopping centres/malls, when it is necessary to make sure that an older toddler or young child doesn't get lost in crowds. Lightweight and foldable. Easily fixes to the pram/stroller. HaloVa Backpack. Great for parents with a baby and toddler or multiples. Perfect for when out and about. Bag is spacious, hardwearing, durable, and has different section pockets (one insulated). Waterproof and can be cleaned. Choice of 14 different colours. Out 'N' About Nipper 360 double pram/stroller. Perfect for newborns and toddlers or for twins and will last from newborn through to toddler (approx 3 years old). Each seat is independent and can be laid flat individually, making it suitable for different aged babies and toddlers. Lightweight frame and adjustable height on handles. Has storage pockets and large shopping basket. Long lasting and durable. Slim to fit through doorways and folds neatly for the car boot. Tires are great on all surfaces and can be pumped up when needed. This triple pram/stroller is perfect for triplets or for twins with an older or younger baby/toddler. It is a basic pram/stroller and doesn't come with any additional equipments. It is for basic use i.e. walks or trips to the park. Lightweight and foldable, durable and long lasting. Suitable from 6 months to approx 3 years old. Little Cooks kitchen play set. Great item for a toddler developing an interest in role/pretend play and for developing their imagination skills. This set includes a plastic kitchen set unit with cupboards, stove, storage, and 21 accessories including set pots, pans, and dishes (pretend food is not included so will have to be bought separately). Also features realistic sounds and lights. Suitable from 2 years old. My first match it game/puzzle. This is a great item for developing problem solving, concentration, memory and language skills. Toddlers have to try and find the other half of each picture, fit the pieces together to make a whole picture, and identify what the picture is. Available in a variety of different themes. suitable from 2 years old. 21 piece creative set for toddlers. This set includes painting brushes, a variety of textured and shaped sponges, textured and shaped tools, stamps, and a free e-book on ideas of how to use. Great item for developing a toddler's hand and eye co-ordination, fine motor skills, and their creative skills. Paints need to be purchased separately and should always be non-toxic and child friendly. Suitable from 2 years old. 10 pack of non-toxic child friendly playdough/doh in a variety of colours. Great item for developing creative skills, imagination, concentration, fine motor skils and dexterity. Each colour comes in a 2 ounce pot (contains wheat so is not suitable for wheat allergy suffers). Playdough/doh tools need to be purchased separately. Suitable from 2 years old. Fisher Price Little People Home. Includes a plastic house that opens up to play with. Inside there are a few different items of furniture and people. All are of a suitable size for little hands. The house has sounds and songs which play when buttons are pressed. Great item for toddlers who are becoming interested in pretend play and helps to develop their imagination skills. Suitable from 12 months of age. Sand and water tray. This item is just the right height for toddlers and young children to stand to play. A large plastic table tray is split into 2 sections (one for water and one for sand) and includes a cover to fit over one side if you only want to use one side at a time. Also includes a water tower and other water toys that fit on the tray. Needs to be assembled before use. Sand will need to be purchased separately. Suitable for indoor or outdoor use and for children from 2 years old. 80 piece mega blocks bag. Great item for toddlers to start their building skills. These blocks are of a good size for little hands and can be held and gripped easily for use and play. Multicoloured blocks can fit together to allow the toddler to begin building a variety of different things, developing their imagination and creativity. The blocks all fit back into the bag for easy storage. Suitable from 12 months of age. Lego Duplo : My first bricks. First Lego set for toddlers. Suitable from 18 months old to begin construction. Contains a variety of 80 coloured lego blocks of different sizes suitable for toddler hands. Toddlers can make a variety of items using the different bricks, developing their imagination and fine motor skills, as well as early mathematical and problem solving skills. Can be used alongside other Lego Duplo products. DISCLAIMER: This website provides information and advice on early years care, development, and education for parents, guardians, grandparents, and early years students and carers. Although I am a qualified early years professional, with over 18 years experience of caring for babies and children from birth to 5 years, I am not a medical professional and do not have any medical qualifications. If you have any concerns about any aspect of a child's health or development, please speak to your Health Visitor or G.P. If a baby/child has any special needs (health, developmental, or educational) continue to follow the guidelines given by the child's doctor, consultant, or educational professional. Products recommended on this website are products (or similar products) that I have found useful in the care, development and/or education of babies and young children. For any products purchased through links on this website I will receive a small commission (paid by the selling company (Amazon) not by the customer). All items purchased are the responsibility of the online retailer.